In 1958 (date of art work above) there were still only 48 states! 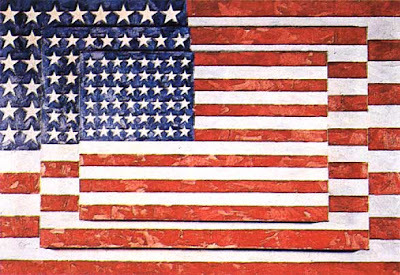 Jasper Johns, a native of South Carolina, moved to New York City in 1953 after a stint in the Army, in search of a career in the arts. Within ten years he was considered the greatest living American artist. He rebelled against the abstract expressionist movement of the time, deciding to paint ordinary, recognizable objects, such as flags and numerals. 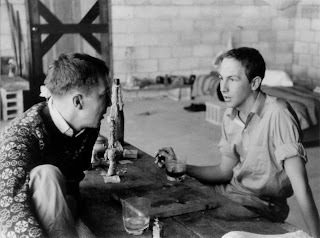 He soon fell in love with an older fellow artist, Robert Rauschenberg (on right in photo at left), who became his mentor and inspiration. They had met while working together creating window displays for Tiffany’s. Lovers from 1955 to 1961, they lived and worked together during that time, but Johns and Rauschenberg parted after just six years because of their uneasiness with being recognized as a couple publicly. Their breakup was so acrimonious that they both left New York City and didn't speak to one another for more than a decade. Johns became increasingly reclusive and eventually moved to an estate in Sharon, Connecticut, where he lives to this day. He has another home on the island of Saint Martin. Rauschenberg died in 2008. 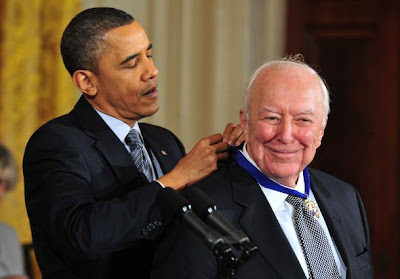 On February 15, 2011, Jasper Johns received the Presidential Medal of Freedom from President Barack Obama, becoming the first painter or sculptor to receive a Presidential Medal of Freedom since Alexander Calder in 1977. Do you know Jasper Mounbatten or Paul UK Tank Park ?